It’s difficult. You don’t job interview very often. You’re not (likely) a trained interrogator. That’s why you have me! Organizations need to be able to think at least three to five years into the future. But, you don’t want to join an organization that only thinks about the future. Thinking is nice, but companies that act and build things and have clarity around specifically what they’re going to do are worthy of you. Join them. It’s a great question because it helps you understand whether they have a vision and if they have clarity regarding specifically what they want to build. If they don’t have that clarity, they’re basically saying to you, “I don’t know if you’ll have a job in three years because I don’t know where the company’s going.” Nice. Huh? You’re looking for the traits the employer wants. The reason it’s a great question is you’ll get the actual traits they’re evaluating and you can use that insight immediately to highlight how you and your background and experience match those traits! Plus, it’s a great setup question for the next one. This is a little safety net for you. You want to make sure you’re uncovering information you might not have uncovered with the questions you’ve designed. What’s your management style and what are your expectations of the position you might not have already mentioned? 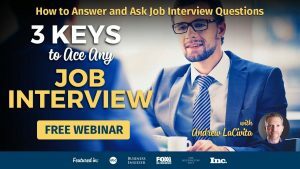 Make sure to check out my free webinar called 3 Keys to Ace Any Job Interview. It’ll teach you everything you need to know about how to answer and ask questions in a job interview plus attendees get a sweet, FREE eBook Ace Your Job Interview. Don’t miss it! This most really fulfilled my desire to learn something about the content mentioned here, I failed a lot of time in an interview due to improper planning but this article taught me those techniques through which I will really make it happen in the very ni\ext interview. You’re so welcome Akshay!!! Glad it helped!!! This is great content! I appreciate it. I haven’t broached an interview this way before. I will now. Thanks so much! You’re welcome Vicky! So glad you liked it! Excellent! Greatly appreciate this. I like question #2. Thank you so much Andy!! This is great information. I wish I had seen this before interviewing for a job two weeks ago. I didn’t get the job after the second interview. I think asking such questions early on would have allowed me to prepare and better tackle the second interview. Andy ! I love your videos & have been watching very closely before my interviews. My question to you is how does one find out if s previous employer is giving a less than favorable review to perspective employers? I have a very solid resume , over 12 management experience in the field I’m applying for. I’ve gone on close to 12 interviews the last 6-7 months and every single time I get no response at all just crickets. I don’t even get a courtesy rejection from HR which is just baffling. Im not the absolute best interviewer but am not bad either , follow up and still hear nothing. Any advice/ thoughts on this…? Seeking help in vegas !